They will each receive a $50,000 college scholarship. A number of other awards were also presented. ScienceWoman has more about Su's work (and the excellent photo above). Scientific American has more photos of the fair and its participants. Looking over the winners that are being lauded as examples of how “any society that relegates women to an underclass is, at the very least, throwing away half their brain trust” - yes, but what may be thrown away if such women are already in an ‘underclass’ NOT based on their gender but based on socio-economic, location and educational factors? Just how many brains are being thrown away regardless of ‘girls kicking arse, doing science’? So while it's a fantastic achievement, the real "have nots" science-education-wise aren't really going to be affected one way or the other by the awards. Of course I'd think that the more girls that win such awards, the more "normal" it will seem for women to pursue science and mathematics - except that the public doesn't even seem to know that the awards exist. In fact, girls have been winning the science fair awards since their inception by Westinghouse (see, for example, Marina Prajmovsky, who won the first Westinghouse Science Talent Search award in 1951). My impression has always been that the top science fairs participants have access to tools that most students - even those who are interested in science - don't have access to. In my own experience, I was a nerdy kid who was interested in science, knew I wanted to study science in college, and yet no one suggested that a science fair project might be something I wanted to do. And it wasn't because I wasn't educationally privileged, since I attended a private college-prep high school. It just wasn't very science-oriented. It wasn't until I was in grad school that I met someone who had participated in the Westinghouse science fairs. He had attended a high school in New York (possibly Stuyvesant, but I don't remember specifically) where there were counselors who specifically worked with kids who wanted to do science-fair projects. They were teamed with mentors, assisted in choosing projects and were sometimes given help getting the space in someone's lab to do experiments. Any independent student from a less helpful high school who was interested in doing a project on her own from scratch would be at a great disadvantage. So while winning an award at ISEF is a great achievement in and of itself, I'm not sure how much it does towards encouraging girls and women pursuing careers in science and engineering, or the general perception that those are "masculine" fields. I think it would be great if more kids from all backgrounds got to do hands-on science projects, but I don't think the solution isn't to provide more options at the high school level. By that point many students are already behind in their math and science education. Maybe elementary school is where kids would be most receptive to trying something new - and might just get hooked on science permanently (or at least learn something). Thanks for the link! I think one element that is kind of overlooked, which I mentioned and ScienceWomen touched upon: the element of creative and proactive teachers who put in the effort to support and nurture the kids. I grew up in a northern state where there was a large discrepancy between the resources of the more rural areas and the wealthy suburbs. I am extremely proud of the fact that in three years participation in the International Fair, I did win a small independent award. It turned out to be something I could not use (a very small scholarship to a school that did not have programs I wanted to major in) but it was great to see my work recognized. Even sitting on the bus with people from the wealthier suburbs who could spend all summer on their projects in university labs was something difficult. However, I am not going to say that these projects should have not won Grand Awards (a lot of them did, multiple times). 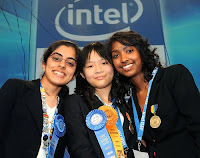 ISEF was a place to do good science and see other people who were trying to do the same. I think there was a great story about a recent "big prize" winner who did a lot of his work in the laboratory closet of his high school. Podblack: You are absolutely right about the role of teachers. Unfortunately here in the US there are science teachers who don't even have much of a science background themselves (see, for example, this PLoS article about biology teachers and evolution). And talking about science fairs specifically, I suspect teachers who don't have science fair experience themselves are much less likely to suggest entering a fair or to mentor students than their colleagues who do have that experience. Maybe the solution is to provide science camps and fairs for the teachers too? Academic: winning any award at that level of competition is a great achievement. I don't want to leave the impression that I think the ISEF isn't a good experience for science-minded students, or that the award winners didn't do great projects. It's more that the winning students not only have great scientific skills, but also have resources unavailable to most students.